Constituting roughly half his net worth, it was important to properly value the business. No matter what method you use, there is one simple message that the client needs to understand: the business is only worth what someone is willing to pay for it. While the client is an expert in running their business, they may not have the perspective to determine its valuation. Ultimately, it will be important to select a solid methodology like looking at recent comparable sales or using a multiple of annual EBITDA earnings. The Small Business Administration has an introduction to the topic online: http://www.sba.gov/blogs/how-much-my-business-worth. For our client, he determined his valuation based on his personal knowledge of an advisory business sold within his area about a year prior. The business was about 30% larger, so he did some back of the envelope math to come up with $3.2M. How do you envision growth in the value of the business between now and the sale? What do you intend to do with the proceeds? For our client, he’s informally discussed selling his book of business to a local advisor, following a 4 year payment structure (25% per year.) He wants to be relatively conservative and estimate the value of the business will grow at 2% per year. At this point, he’s not sure what his plans are for the proceeds. When building the plan, we’ll capture the business in a way that allows us to show current net worth, as well to model different valuations and different sale dates. We’ll set up the business as an asset, capturing the growth, timing and income from the sale as details of the asset. It can be tempting to just include the income from the sale but it locks you into a very specific valuation and timing, restricting your value as an advisor. 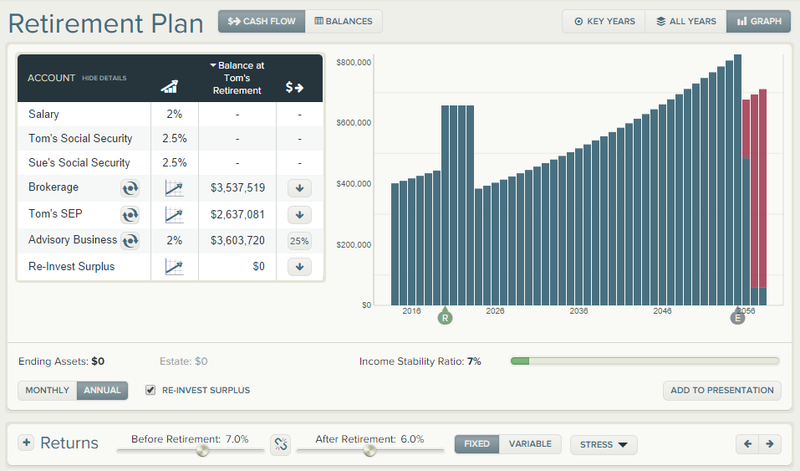 Taking a quick look at the plan, we can see the significant spike in income in the first four years after retirement at age 55. By retirement, the value of the business has grown at 2% annually to $3.6M. By selecting “Re-Invest Surplus”, we put the proceeds from the sale back into the market. Let’s take a look at the details. In his last working year, his income has grown to $607K. We can see the non-qualified gross income from the business broken out across four years, along with the net income. Taking a closer look at the plan, though, we’re not done. There is a shortfall at the end of the plan, with no remaining assets. We can easily solve the shortfall by putting off the sale of the business by a year or two. 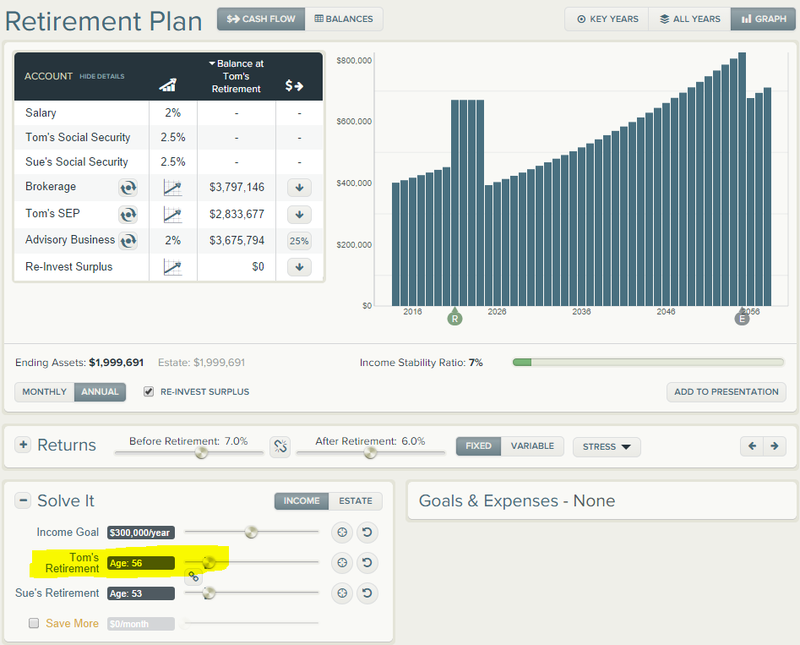 By pushing off the retirement date by 1 year, the shortfall is erased and ending retirement assets jump up to almost $2M. Not bad for a years’ work! 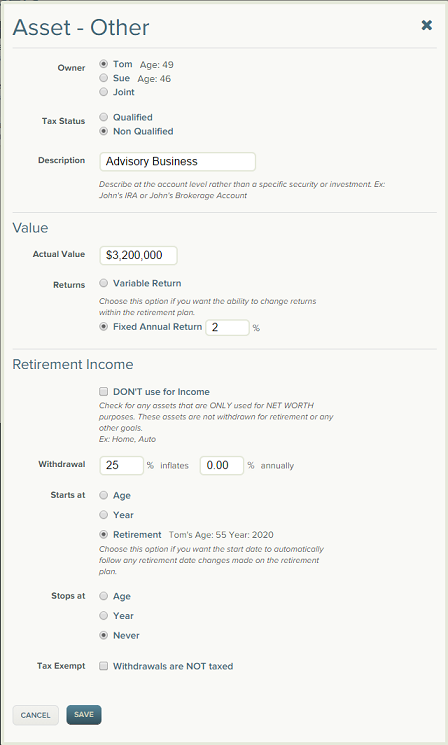 RetireUp case studies are based on real-life scenarios built in collaboration sessions between Advisors and RetireUp coaches. Names and details are always anonymous. If you're interested in signing up for time with a RetireUp coach, please sign up online!